into the GrillKicker™, put a match in the window and let it smoke. The GrillKicker comes with 2 hickory cartridges. Refill cartridges available in 9 flavors - 4 cartridges per pack. 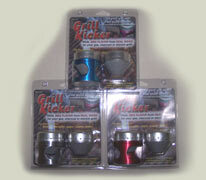 The GrillKicker™ comes in 3 colors. 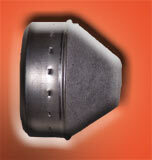 Up to 1/2 hour of smoke from a single cartridge. BBQ flavor comes from cooking over real wood. 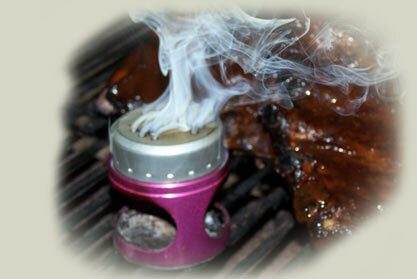 Great barbecued ribs, steak, fish and pork come from using real wood smoke for the natural flavor of barbecue. electric, even charcoal bbq grill. Many 100% natural wood flavors! the Smoke Pistol for up to 4 hours of smoky goodness! 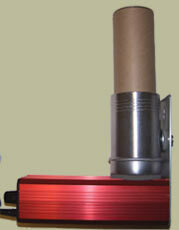 The GrillKicker™ delivers real wood smoke for your smoked cheese. Try this! Smoked cheese made in a cardboard box.